We have a mailing list of people looking for this monkey. I’m looking for a Koala Baby No. 1415352 15 inch brown terry monkey with tan velour face and ears. My son and his little monkey are best friends. He feeds him his bananas and lets him wear his cloths and share his blanket. Even when “munkey” is not around he is constantly talking about him. Any time my little boy is sad his monkey friend can cheer him up. I am not fortunate enough to be home with my son, like many others I also need to work full time, but still am unable to afford day care. My son spends time with my mom everyday, but is not around any other children. This little friend of his gives him something to play with and talk to everyday, so he is not as lonely. He is learning how to share and love others through this little monkey. Here is another one on ecrater in Ella-bellas-toy-room store. Hope this helps. I am also searching for this Koala Baby No. 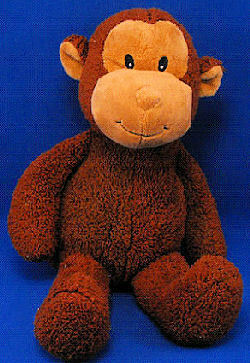 1415352 15 inch brown terry monkey with tan velour face and ears as well. my son loves this monkey and had been attached to him since he was 3 months old. Please let me know where i could find this monkey. Hi im looking for the koala baby monkey style 1415352 my daughter is five and has had her jojo since birth she takes him everywhere and i now have a one year old niece who has fell in love with jojo and i would love to find two to purchase if anyone could help thank you so much.